Having fallen in love with Lawrence Anthony’s book “The Elephant Whisperer”, it was an incredible experience to go out on safari and ‘meet’ his elephants. Their rhino conservation programme is just as inspiring. As is Francoise’s Afro-French cuisine! I was also lucky to join a yoga session the next morning on the deck, with an audience of monkeys, elephant and circling vultures! Family owned and operated, Thula Thula was home to the late Lawrence Anthony, conservationist and best selling author of 'The Elephant Whisperer'. Only two hours north of Durban in a malaria-free area, the oldest private game reserve in KwaZulu Natal provides sanctuary for elephant, leopard, rhino, buffalo, superb birdlife and more, combined with Zulu history, style and good food. And now there is also a rhino orphanage for the rehabilitation of injured and orphaned wildlife. The Safari Lodge has 2 luxury open-plan suites and six thatched rooms, decorated in ethnic and Colonial style with exceptional gourmet dinners. The relaxed Tented Camp has 8 stylish safari tents each with a private viewing deck and en-suite bathroom with Victorian bath, 6 with an outdoor shower. An authentic African bush experience with traditional South African home cooking. Game drives, massages, cooking classes and more, including a visit to a nearby Zulu village to meet a traditional “Sangoma”. 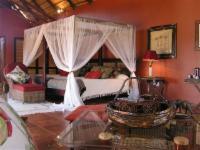 "OUR STAY AT THULA THULA WAS REALY GREAT. BOTH OUR GUIDE, VICTOR WHO WAS AMAZING AND VERY KNOWLEDGEABLE, AND THE HOSPITALITY STAFF WENT OUT OF THEIR WAY TO ENSURE THAT ALL OUR NEEDS WERE MET. IT FELT LIKE LEAVING FRIENDS AS WE LEFT. DEFINATELY THE MOST WARM AND WELCOMING GAME RESERVE THAT WE HAVE VISITED." "We had the pleasure of spending four days at Thula Thula, this being our second visit. Once again we were floored by the care and attention of all the staff. When we requested a move from the family tent we booked to the lodge, we were accomodated within munites by Zelda and our bags transfered to the lodge whilst we enjoyed the afternoon game drive. The guides and rangers are just superb! they manage to delight on every drive or walk and each experience surprised with something new, both big and small, elephants, rhino, birds, insects and even the birth of a little giraffe! Siya, Victor, Promise and Shando, we love spending time with you. Rose, Cindy and the ladies at the lodge, thanks for looking after us and spoiling the boys as you always do. Keep well and we'll be back soon!" Off N2 North at Empangeni.Take direction to Nkwaleni, Melmoth, take turn-off to Heatonville. Follow signs. 10 km on dirt road from Plettenberg Bay on the N2 to Knysna. Turn left at the Hunters Country House signboards and travel 1.5km along the gravel road.